My friend Michael really loves pie. So when we went over for dinner last night, I was in charge of bringing a gluten-free dessert, and I knew pie was the way to go. 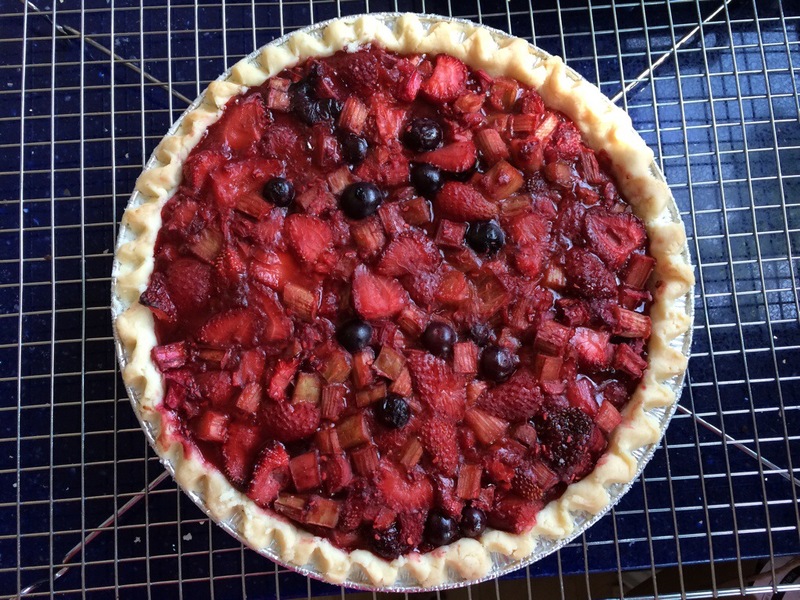 We got some gorgeous local + organic rhubarb in our veggie box this week, so when we were at the market on Saturday morning we also picked up some local Ontario strawberries so I could make a strawberry + rhubarb pie. And I am oh-so-glad we did! I also had a few blueberries and raspberries (a scant handful of each) leftover from last week, so they went into the pie too — but they are absolutely not necessary ingredients. But if you have extra berries, throw them in! The crust was a bit of a cheat… when I made the Melktert for my Dad last weekend, I knew I’d want to make another pie this weekend. So I made a double batch of the Gluten-Free Pie Crust so I could test out how it froze. I used half for the Melktert, and froze half in a disc (make a ball, flatten it, and wrap it in plastic-wrap) in a freezer bag. Then yesterday morning, I took the frozen pie dough out of the freezer and proceeded to worry all day that it wouldn’t thaw in time for me to make pie for dinner! But after about two hours it was so defrosted that I even put it back in the fridge so it would be cool enough to work with! 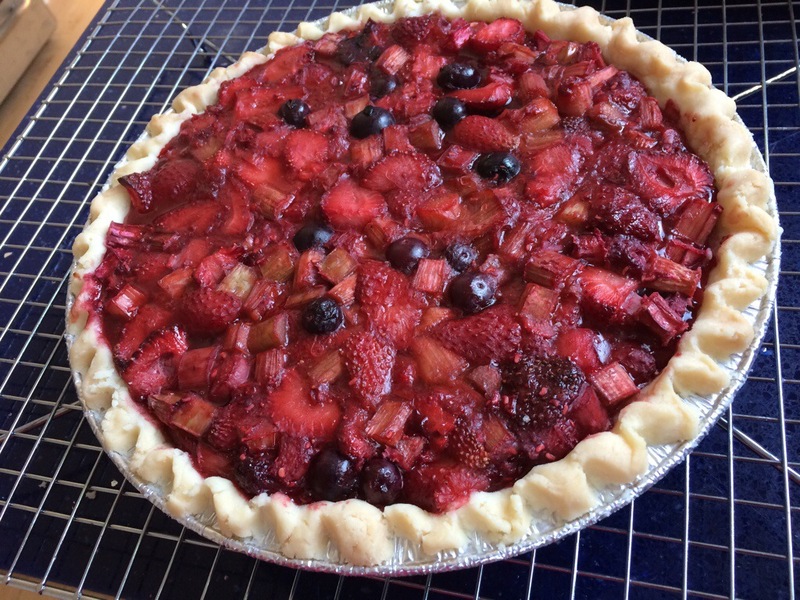 I personally prefer single-crust (no lid) sweet pies (and double-crust savoury pies) — so I was happy to just have a bottom crust for this fruit pie. The fruit collapsed down as it baked, and the bubbling red juices surrounded the berries & rhubarb. And because of the tapioca starch, it set quickly with about 2 hours of resting time on the countertop — we didn’t have that “soupy” problem that fruit pies can get. Success! So Mr. KitchenOperas and I traipsed off to Micheal’s, with our pie in tow. Micheal and Nicole (who are now engaged!!! ), made us a glorious dinner. They got back a few weeks ago from a trip to Cambodia, where they were building homes for families in need. And they brought back a taste of Khmer cuisine with them, treating us to Loc Lac — which is usually stir-fried beef, but they made me a veggie-friendly tofu version! 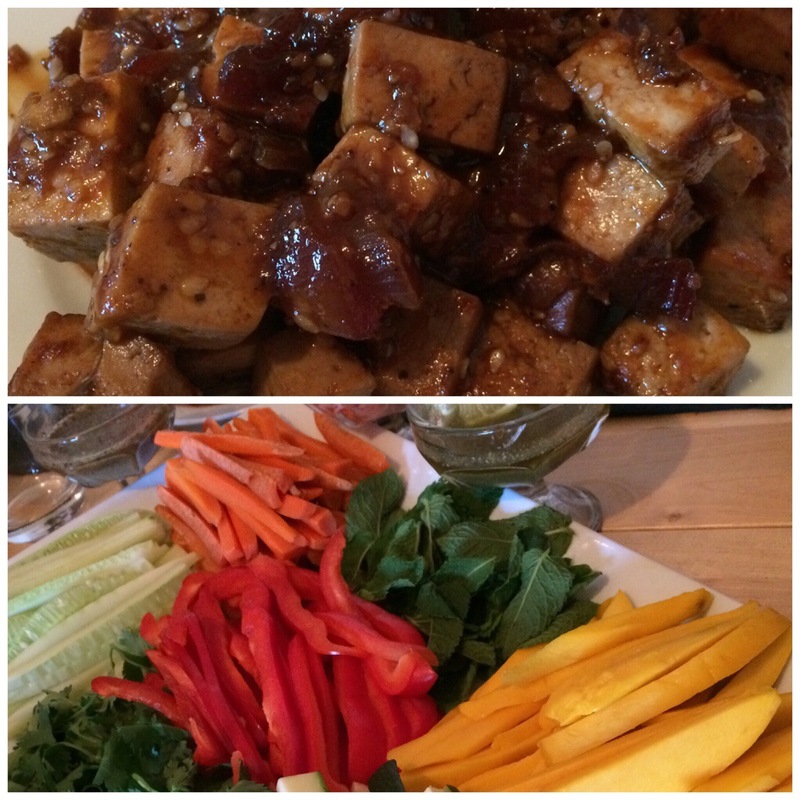 The protein is cooked in a sweetened soy sauce and drizzled with pepper-lime dressing. We then wrapped up the proteins (tofu for me, and beef + pork for the omnivores) in rice wraps & lettuce wraps along with fresh veggies, mango, mint & cilantro, rice vermicelli, pickled ginger, chili-garlic sauce, and more pepper-lime dressing. After such a gorgeous and umami-filled meal, we really enjoyed the pie, which was tart and not-too-sweet. Michael complimented the crust, saying it would fool gluten-eaters into thinking it was a traditional (gluten-y) pie crust. I loved how the bright red juices looked against the pale crust! I didn’t blind bake the crust, and it didn’t get soggy. But… I also baked the pie in its pan right on top of a cookie sheet (to catch any stray juices); this made the bottom edge of the crust a bit too pale for my liking. So next time, I’d put the cookie sheet one rack down, so it could still catch any drips. Yup, dinner was a complete success! And if you like rhubarb, you’ll like this pie. This pie is naturally tart from the rhubarb — if you want a sweeter pie, up the sugar to 1 cup. The dough freezes really well if you want to make a double-batch for future pie. When the pie comes out the oven, the juices may look like they’ll never set… but trust the tapioca — after letting it cool at room-temperature, the juices set up wonderfully. Take out the chilled dough, and roll it out into a circle that fits your pie plate. I like to put gluten-free doughs between a bottom-layer of parchment or wax paper, and a top-layer of plastic wrap to roll them out with the least amount of mess and sticking. Once your dough is rolled out to the right size, peel off the layer of plastic wrap, and put your greased pie plate upside-down over top of the dough. Slide your hand under the layer of parchment, and flip the whole thing over, so you have your dough in the pie plate. Peel off the layer of parchment, and press any cracks together with your fingers. Flute the edges with your finger. In a large bowl, whisk together tapioca starch, sugar, and salt. Add the lemon zest, and pinch it into the dry mixture with your fingers to incorporate the lemon flavour. Toss in the strawberries, rhubarb, and booze (or lemon juice), and mix everything well to coat the berries and rhubarb. 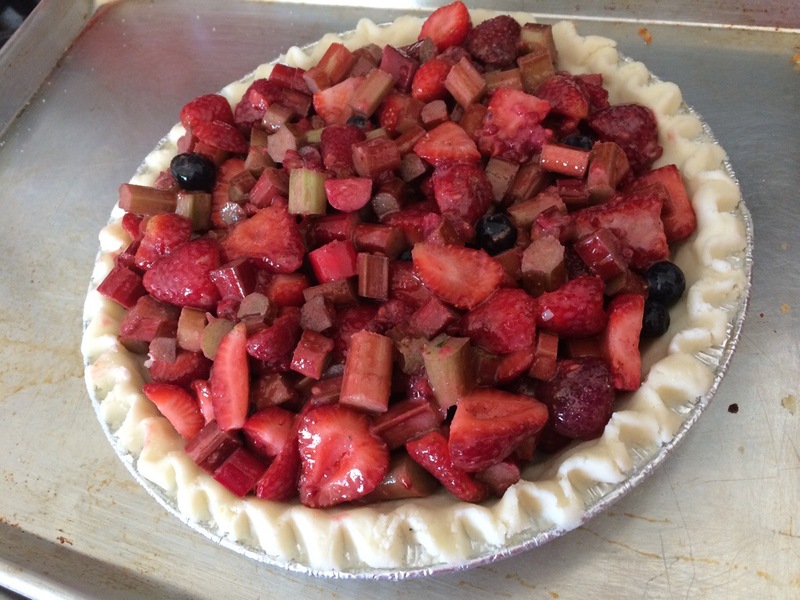 Dump the fruit filling into the unbaked pie crust, and spread it around evenly in the pie pan. Bake at 400F for 20 minutes, with a cookie sheet on the rack below to catch any drips. Then reduce the heat to 350F and bake for another 25-30 minutes, until the fruit has collapsed, the juices are bubbling, and the crust starts to turn golden. Remove to a wire rack and cool in the pie pan at room temperature for at least 2 hours — this allows the berry mixture to set. Gorgeous! And looks so delicious. I have been wanting to try a gluten-free crust and this one looks perfect!